The Junk Rig Association are serialising this blog in their members magazine, starting at issue 65. Back issues are all available to JRA members for download and it’s a mine of useful information. Recommended. Tammy Norie sailed again for the first time in nearly 30 years. I decided that my goal would be to attend the Junk Rig Association AGM and junket on 2014-05-03. After two long and intense weekends of restoration, we towed Tammy Norie to West Solent Boat Builders in Keyhaven on the morning of Friday 2014-05-02. In spite of the scary list of rules on their web site, they’re an extremely friendly and helpful bunch and I highly recommend them. 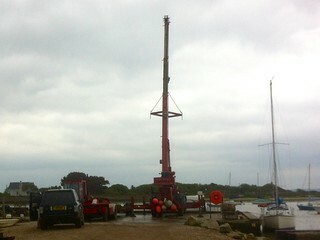 They craned Tammy Norie in without fuss just after lunch. I told them that she hadn’t been in the water for a long time, and they gave me some extra time to check all the skin fittings before they let her go. It was extremely exciting and pleasing after all the effort of the past few weeks. 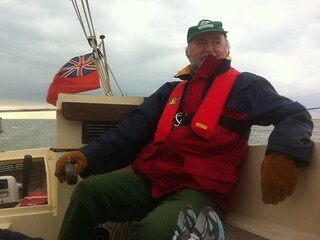 Once we were in the Solent proper we made sail. It was easy. Too easy. It’s really quite strange to be sailing a junk rig after thousands of miles of Bermuda cruising. Whatever I did with the sail Tammy Norie pressed on at a reasonable pace. (At this stage I had no log fitted to fine tune the speed.) There was no particularly bad position for the sail, but on the other hand there was no obvious sweet spot either. I’m sure this is partly my inexperience, but I’m quite happy about it in any case. Here’s Dad at the tiller under engine. Unfortunately, because we had to leave Keyhaven at high water the tide was leaving the Solent at quite a pace, preventing us from getting to Yarmouth. 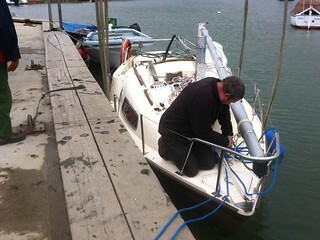 After a few tacks we started the engine again. Motoring against the Solent’s half-tide ebb just off Hurst Castle made it work hard, but 10hp is oversized for a Coromandel and it had no trouble pushing us along like a speedboat. 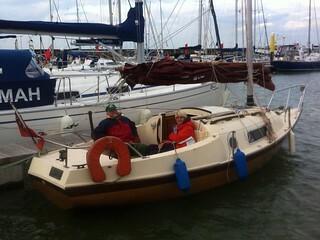 In fact, once we reached Yarmouth the problem was stopping! 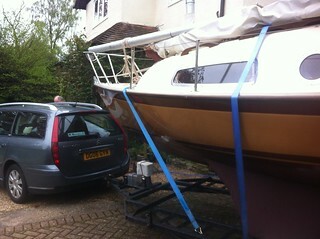 The engine didn’t want to run slowly and I hadn’t got the knack of knocking it in and out of gear. The birthing staff were very helpful and we managed to get onto a pontoon without too much difficulty. I did have to leap off and manhandle her a bit. It’s a good job she only weighs a ton. We figured out later that the throttle cable had a kink in it from all the years of storage, but a small adjustment sorted it out. So there, we’d made our first tiny passage on the restored Tammy Norie. It’s really wonderful to do this on a boat you’ve restored yourself. Very satisfying. Earlier I’d had a text from Sally Peake of the Junk Rig Association telling me that Anthony Cook kept his boat in Yarmouth. I texted him and he invited us to the Yarmouth Yacht Club, where we had a delightful time with him and several other JRA members, all planning to hop to Lymington with him the next day. The day when I broke the boat.